July 16, 2015. Field Meeting in Five Points. 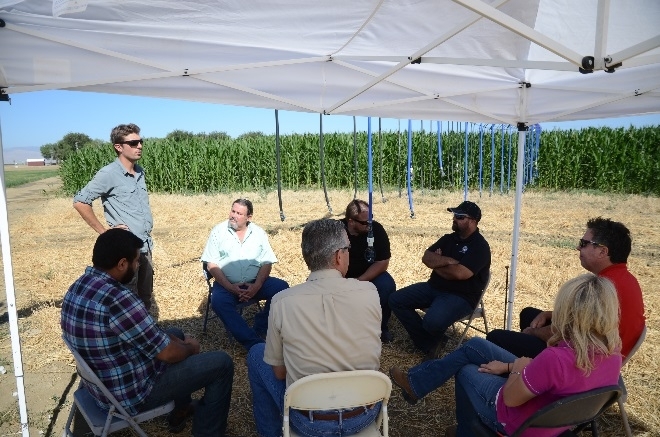 UC Davis Horticulture and Agronomy graduate student, Gerardo van den Hoek, hosted a group of irrigation technology suppliers from Rain For Rent (San Joaquin, CA) and Reinke Mfg. (Deshler, NE) at the field site where he is conducting the second year of his MS thesis project in Five Points, CA. van den Hoek works with a large team of UC colleagues including Dan Putnam and Jeff Mitchell of the Plant Sciences Department, Jeff Dahlberg of the Kearney Agricultural Research and Extension Center, Dan Munk, Kurt Hembree, and Tom Turini of UCCE Fresno County, and a number of other partners including Anil Shrestha of Fresno State, Rick Hanshew of Reinke Mfg., Dan Schueler of Senninger Mfg., Barbara Kutzner of Monsanto, Monte Bottens of California Ag Solutions, and local Five Points farmers, John Diener and Scott Schmidt. 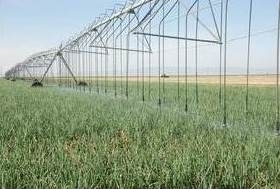 The field meeting took place on July 16.
van den Hoek and his advisory team are evaluating the performance of four corn and four forage sorghum varieties under deficit irrigation using the center pivot irrigation system as the means for imposing roughly 100%, 70%, and 40% amounts of full ET (evapotranspiration) following the application of full ET during the early part of the season. The deficit treatments were recently initiated and van den Hoek's calculations project roughly 25 inches of water being applied to the 100% system, about 20 inches going to the 70% system, and 17 inches to the 40% treatment by the end of the 2015 season. Varietal responses of the corn and sorghum crops are being evaluated in terms of growth and development, yield, and forage quality. The team will host a public field education event later in the 2015 summer. Amelie Gaudin discussing ecological practices with farmers. 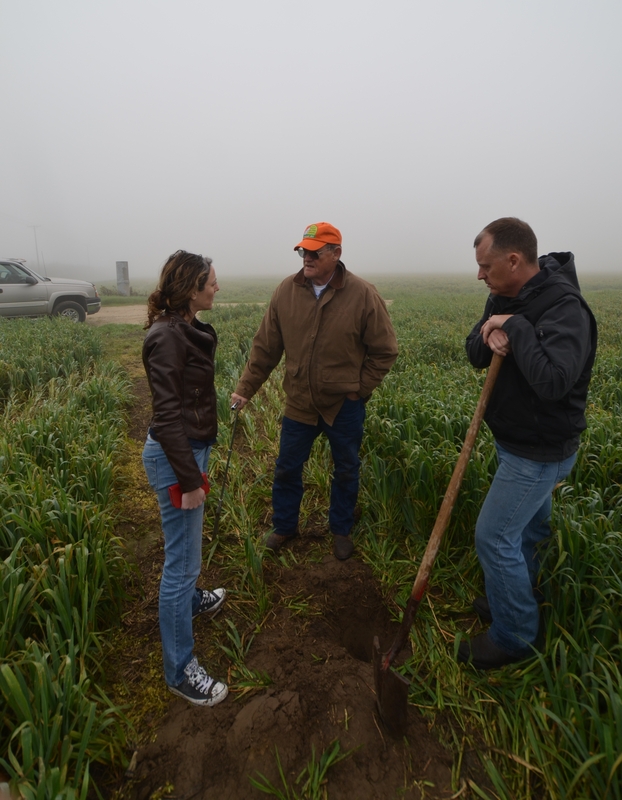 CASI farmer members, Michael and Adam Crowell of Turlock, Darrell Cordova of Denair, and Scott Schmidt of Five Points, along with Jeff Mitchell, hosted Amelie Gaudin, the new professor of Agroecology in the Department of Plant Sciences at UC Davis at their farms on January 23, 2015 to share with her information about their farms and the efforts they have made to improve their crop production systems. 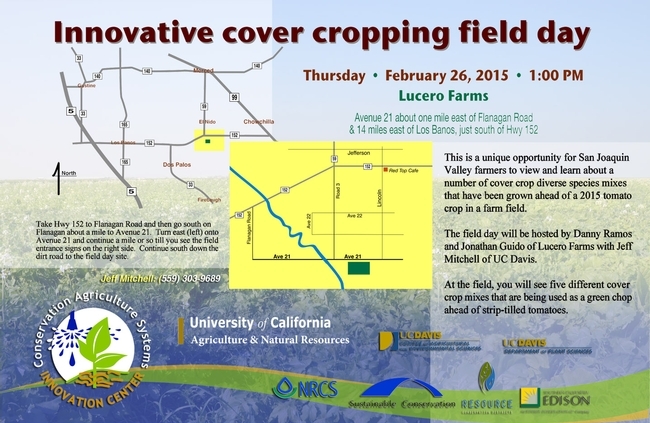 Each of these farmers very graciously welcomed Dr. Gaudin who has been on the job in Davis for only three weeks. Dr. Amelie Gaudin has tremendous experience with cropping system ecology and is currently establishing her research lab in Davis that is focusing on using agroecological principles to help develop efficient and resilient cropping systems. Three current themes that she will be emphasizing in her research program of her lab group are ecological intensification, climate-smart agroecosystems, and evolutionary root ecology, - all very nicely related to the core goals of our CASI Workgroup.